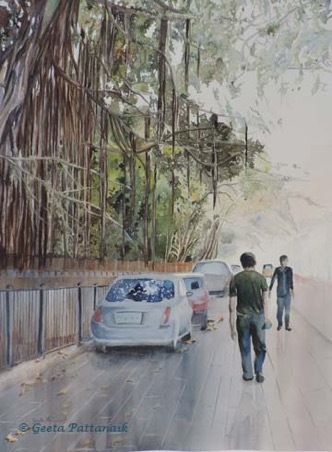 This month I attended a five day workshop with John Salminen at The Fallbrook School of the Arts. It was a truly rewarding experience. There were 17 other attendees, so we learnt a lot from each other as well. John did one demonstration during the week and I also saw another demo on the Sunday previous to the workshop at the Fallbrook Arts Center. I have admired his work so much that just to be able to take a workshop with him was amazing, but seeing his step by step approach to each person's work was something that I admired because of his dedication and tireless help for those five days. I completed the painting above, beginning with choosing the image, deciding on the composition, drawing it on watercolor paper, and only on the third day, to start painting it. Each one of us was rearing to paint, but he held us back until we had drawn everything in great detail, and then he sat down with each person to do a value sketch. By the afternoon of the fifth day almost all of us had our paintings finished. The final step was to put each one up and have him say a bit about the painting and then have one of the attendees say a few words. Some of the artists had very beautiful, moody paintings. John's wife, Kathy, helped us in many ways, including the use of the atomizer on our paintings. Both of them are such dedicated organizers, that they had everything planned ahead of time. John said he was as vested in our painting as we were and would work to see the painting was the best we could produce. My favorite moment was when he was wetting the paper with a big brush and I was painting after him. He said, "It is like duelling paintbrushes," to which I laughed and said that it was such a surreal moment, as I have looked at his paintings in art magazines for hours, and to be painting on the same paper with him, was unbelievable.